Description: A pair of BN units on NS seen from the Chicago Skyway. Description: These were the days, the days when you could count on stack trains being lead by a pair of dash 2s. Now the dash 2s are being put into the storage lines. 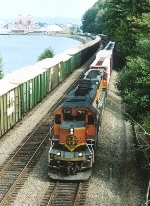 Description: BNSF westbound out of Delta Yard picks up speed past Howarth Park Everett. Description: An eastbound CSX train, with a strange mix of power, approaches Shenanoah Junction, West Virginia. Description: EB detour with awesome power, the last unit a rare Metro North Geep. Description: EB detour with a UP unit, this is also my first photo taken at Bridgewater. Description: Detour train from Willard, OH to Selkirk, NY. Description: crawling through Nickerson waiting on a Northbound coal load.